The name refers to scarring (fibrosis) and cyst formation within the pancreas that was first documented in 1930s. Due to the abnormal secretions, lung infections are frequent and breathing difficulty is the most serious symptom. 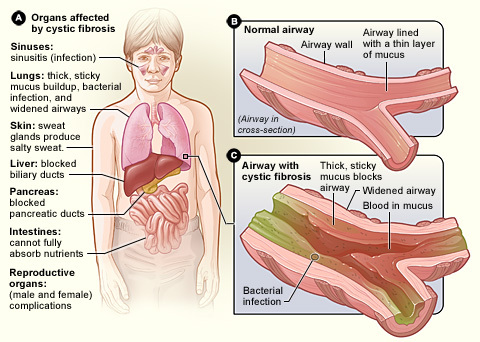 Other cystic fibrosis symptoms are poor growth, enlarged heart, sinus infections, respiratory pulmonary diseases, digestive problems, infertility and abnormal pancreas function. The first indication of cystic fibrosis are salty skin, poor growth and weight gain despite normal food intake, thick sticky mucus, frequent respiratory infections, persistent cough and shortness of breath. Lungs and sinus infections result from clogging because of the thick sticky mucus, reduce ciliary mobility and inflammation. Inflammation and repeated infections cause structural changes in the lungs leading to many symptoms; in early stages, constant coughing, increase phlegm production and decrease resistance to effort and physical exercise. In later stages, when structural changes in the lungs and airways occur, there are breathing difficulties and difficulty in getting enough oxygen to the blood (hypoxia). Coughing up blood, recurrent pneumonia, high blood pressure in the lungs, respiratory failure, heart failure, are other serious symptoms. The para nasal passages and sinuses may also be affected due to the thick mucus and sinuses infections are common, together with their symptomatology, headache, facial pain, fever, nasal drainage. Nasal polyps are also very common to develop as a result of multiple sinus infections. Cardio-respiratory complications are the most cause of death in people with cystic fibrosis. The lungs of persons with cystic fibrosis are infected and colonised with bacteria from an early age. These types of bacteria and their characteristics change and develop in time in persons with cystic fibrosis, because they have a perfect environment in the thick viscous mucus and they develop resistance to commonly used antibiotics. More often these types of flourishing bacteria are spread between different individuals with cystic fibrosis. People with cystic fibrosis have to be aware of this danger and avoid spreading these dangerous strains of bacteria among other cystic fibrosis sufferers. In healthcare facilities, people with cystic fibrosis should be isolated from one another and strict hygiene should be maintained to avoid spreading strains of bacteria among them. Beside uncommon strains of bacteria, different types of fungi and / or yeasts can chronically colonised the airways, some of them found almost exclusively in patients with cystic fibrosis. Defective mucociliary clearance favorites the growth of these fungi / yeasts colonies, together with prolonged antibiotic and corticosteroid therapies that also favorite their growth. The respiratory complications can be reduced using salt therapy. Hypertonic saline solution is used in hospitals to help in clearing the thick stagnant mucus and avoid infection. The long-term salt aerosol exposure, in home salt therapy, provides exposure during the night sleep, when the micro particles of salt slowly deposit on the respiratory mucosa. It helps to make the thick mucus more fluid, unclogs the airways and reduces the inflammation. Salt is known to have bactericide properties and helps in fighting bacterial infections, beside its mucolytic and anti inflammatory effect. Using a home salt therapy device will create a seashore microenvironment in your own house. Find more about different salt therapy methods of treatment, distinguish between them and be able to take an informed decision for your respiratory condition. Salt therapy has been used long ago and was first documented in the 19th century when a Polish physician at a salt mine noticed the health effects on miners. Many salt sanatoriums were settled in old salt mines all over East European countries… more here "Salt Therapy – from History to Modern Approaches"
1. Artificial Salt Rooms – usually they use a halogenerator to create very fine rock salt particles that are dispersed into the salt room for breathing. The walls and floors of the salt room are also covered in rock salt. A session is about 1 hour in length and 2-3 or more people are relaxing or exercising in a room while breathing the salt aerosol. The cost of a session can be anywhere between $30-$60 and at least 6 sessions would be recommended to have results. Being exposed for 45 minutes – 1 hour at a time the salt aerosol concentration is relatively high but controlled by halogenerator. There are artificial salt rooms that do not have a halogenerator. The salt aerosol is created by brushing a salt brick with a steel brush to generate fine particles of salt. The concentration of salt aerosol here is usually lower than in halogenerator operated rooms. Exposure and cost are the same. Therapeutic effect is lower here than in a halogenerator salt room due to the fact that length of exposure and aerosol concentration is not correlated here. 2. Saltair, home salt therapy device – is a small device that uses ultrasonic technology to create and release microscopic salt particles into the indoor air for breathing. The salt aerosol is created from a saline solution and is similar with seashore aerosol or salt mine aerosol. It is recommended to be used during the night sleep, offering 7-8 hours exposure, absolutely necessary in chronic respiratory system diseases, for lasting results. The concentration of salt aerosol is correlated with the length of exposure and home use. No salt deposits will be noticed on room furniture and no bad effects on electronics. Sodium sensitive people are not to be concerned because there is no significant apport of salt in the body. – Inexpensive – $99.99 a Saltair device that will last at least during 1 year warranty; lifetime span is 2 years. 3. Salt Inhalers – are small hand-held devices made from plastic or ceramic, filled with rock salt. The rock salt inside generates micro particles of salt by rubbing against each other and inhaler walls. You have to breathe through mouth and exhale through nose, starting from 15 minutes a day and increase to 1-2 hours a day. – Sodium sensitive people should avoid shaking the salt inhaler every time they breathe through and use it for extended periods of time, especially in ceramic salt inhalers where more salt particles will be generated by shaking. – They are not suitable for small children, under the age of 5 because it needs active involvement of the user – hold it and breathe through it in a specific way. 4. Salt Lamps – made from different rock salt, they come in many colors and shapes. They have an esthetic look and provide nice, smooth light, looking good in a living room or bedroom. It is claimed that they releases negative ions of salt once they get heated by the light bulb inside. However, it is known that natural rock salt naturally emit negative ions of sodium chloride.